Compare inbound links with the SEMrush Backlinks Comparison Report! Who has more quality backlinks? 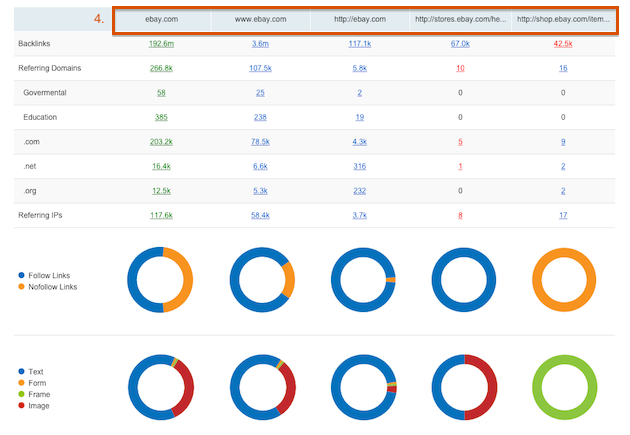 Now you can estimate backlinks’ weight of your competitors’ domains in a few clicks! Go to the new Backlinks Comparison report, simply enter up to five domain names into the Backlinks Comparison’s search bar (1), and click the “Compare” button (2). You can compare side-by-side up to five domains according to the number of their inbound links, referring domains, IP addresses, and TLDs (3). This report will also allow you to determine the types of backlinks found on these domains. This report will not only help you gather link-building intelligence on your competitors, it will also allow you to compare the individual pages (4) of your website and see which of them have incoming links with the most weight. You can easily convert data from this report into PDF format. Discover the New Indexed Pages Report for Backlinks!